It was an honor and a privilege to host the twenty-sixth annual Standard Bearers on September 2, 2017 in the western borough of Parma in our beloved Cleftlands. We give great thanks to all gentles in attendance and to those who participated in our challenge A Heroic Age in the Cleftlands. We were regaled with many tales and effigies from the ages past, the nearly past, and given a glimpse at heroic deeds yet to come. Special thanks to the following staff members in no particular order (that strangely resembles the event staff list) – Meinhard Hammerschmidt (Steward), Ginevra Boscoli (Gate/Signet), Oliver Stillman (A&S Coordinator), Thorin Eikskjald (Armored MIC), Ladislas Vulcu and Jao Veludo Alfonso d’Albuquerque (Rapier MIC), Edward Brackenburye and Milesent Vibbert (Archery MIC), Jolicia atte Northclyfe (Breakfast), Claricia de la Mere (Lunch), Angharad ferch Tangwystl (Feast), collectively the Cleftlands Cooks Guild (Lunch and Feast), and all the others who assisted throughout the day whether marshaling, serving, or lending a hand where needed. Many hands made light (and quick!) work! 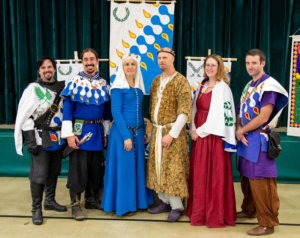 Velvet, Cadfan, Baroness Gianna, Baron Crispin, Aurelia, and Urrich. Photograph by : Tarmach ben Yehuda al-Khazari. Once again, thank you to all who participated to make this an amazing first Standard Bearers! We hope that a good time was had by all.